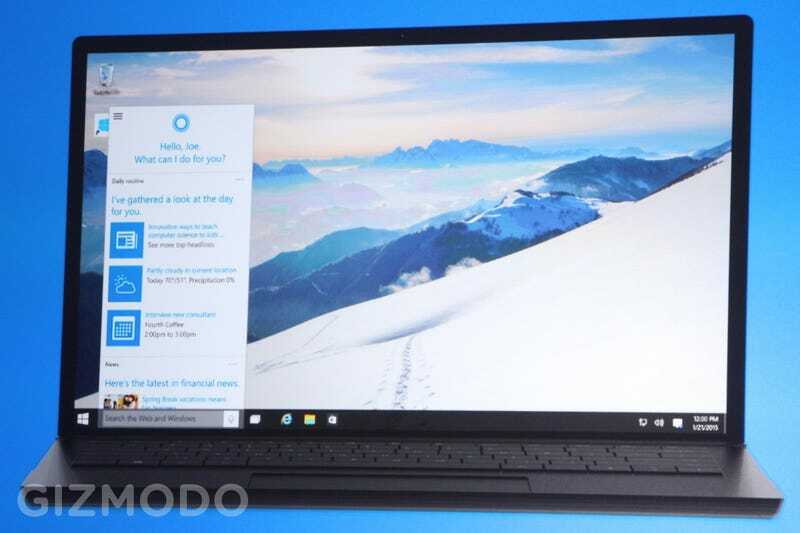 Microsoft's Cortana voice-assistant is coming to Windows 10 as we expected. Now you'll be able to speak commands and ask questions throughout the operating system. At its core, it's similar to the assistant we've seen on Windows Phone, but it's also been updated to create a more holistic experience. On stage at today's Windows 10 event Cortana was demoed by Microsoft's Joe Belfiore. From the looks of it, Microsoft has greatly improved Cortana's natural language skills. Cortana will be able to do much of the internet sleuthing and appointment-making we're used to. But now, in addition to getting Cortana on your Windows Phone device, Cortana will be on your desktop, too. This makes total sense, since Windows 10 is supposed to cover all devices. Cortana will now be able to search for documents on your computer. For example, you can search for a specific Powerpoint presentation or Word document. You can also search for contextual information, like "photos from December." Additionally, Cortana will search your documents in the cloud that Cortana has access to—so basically OneDrive. There some features that make Cortana sound a bit like Amazon's Echo assistant. For example, you can ask Cortana to play you music, and lo, Cortana plays you some tunes. You can also use it to dictate an email. Like other voice assistants, Cortana learns about your tastes and preferences. Cortana makes it easy to figure out what this saved information is with a new feature called Notebook, which keeps track of the sports scores, travel, weather, and other information you're likely to be looking for. From Notebook, you can also easily add something else you'd like Cortana to keep track of. Cortana is coming to Microsoft's Project Spartan browser. Perhaps the most obvious place to integrate Corana is in the web browser search bar. Rather than force you to search all the way for something, Cortana can use its brain to predict what you're going to want. Type "weather," and it shows you the weather. Type "Delta" and your flight information pops right up. Cortana also pops up with information as you browse the web. So if you land on a restaurant webpage, it'll automatically pull up information you might want to know, like directions and its menu. Cortana isn't just your voice assistant. The search bar built into the Windows desktop is no Cortana's property, too. Start typing in a search, and you'll see the little Cortana swirl work on generating an autocomplete. It seems, that across the Windows interface—and across devices—Cortana is the name of the intelligence that helps you get things done. Like Clippy, except useful and not annoying.